In part 1 of this series, we looked at how we could test your entry methodology to see if it getting you in on the right side of the market better than 50/50. Part 2 looked at adding in an exit methodology to capture as much profit as possible. In part 3, the last in this series, we will look at testing our stop loss methodology to determine the best method of protecting our capital, while maximizing our chances to allow the trade to work and, in turn, provide a profit. The main difference between testing exits and testing stops is that the priority of an exit is to capture profits, while the priority of a stop loss is to control risk. However the testing of different stop loss methodologies is very similar to testing exits. 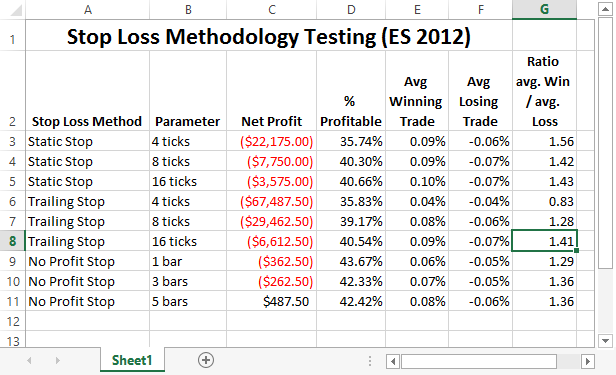 To test stop losses, we choose an entry methodology to get us into the market. To test our stops without an exit, this will be a reversal entry system; If we are long and we get a short entry signal, we exit the long and go short. To test your stop methodology, you will want to again choose a period of time and run your tests against that period varying on the stop loss method. Again, you may want to try testing across several different market types as well as different instruments to see if your results vary significantly. To analyze the results of your stop testing, you again will want to look at the Net Profit as the primary number to maximize. However you may also want to look at the maximum drawdown number as the primary job of the stop is to protect your capital. Dollar Stop: When we enter a trade, we simply determine the maximum amount of equity we are willing to lose. For example, if we are willing to lose $200, that means we can have a 2 point stop on the ES with 1 contract, or a 1 point stop with 2 contracts. For equities, it means we would have a $10 stop with 20 shares. Support/Resistance: These are common stop areas for traders, although the definition of support and resistance can be subjective. One example would be finding the most recent low over the last 20 bars, and setting the stop to 1 tick below that price. No-profit Exits: Several good traders have observed that the best trades seem to be profitable right away. Therefore one stop would be to exit the trade after X number of bars if the trade isn’t profitable. A break-even stop is a stop that is placed at the entry price after a certain amount of profit has been achieved by the trade. Trailing stops are stops that continuously reduce risk as the trade moves in your favor, and never against you. These stops work to capture the profit of the trade as it moves while also limiting your risk. There are some general conclusions we can draw from different stop loss methodologies. First, a smaller stop loss will generally reduce your win/loss %. However this also means that your winning trades will be a much higher multiple in terms of R, or your initial risk. Wider stops conversing will usually increase your win/loss %, but your losses in term will be larger. You will need to examine what is most important to you and your risk tolerance to determine what is best for you. As an example, I took our previous simple SMA(5, 20) crossover entry methodology on 1 minute bars, and added in some stop loss strategies to it to determine the best stop loss method for this particular entry. I tested a static point stop at 4 different levels (1 point, 2 points, 4 points), a No-profit stop after 1, 3 and 5 bars, and a trailing stop with values of 1, 2 and 4 points. Our results show a few things we would expect. Our win % increases the larger the static or trailing stop we have. Correspondingly, both our average winning trades and average losing trades increase with the size of the stop. However, notice the differences between the 8 and 16 ticks stop losses. The win % are only a little higher, but there is a large difference in net profit due to our winning trades being higher. The No Profit Stop fared the best in the test although the results were quite similar. The win %s were close to the same while the Win/Loss Ratios were also close. The Average Losing Trade was the smallest out of the whole test indicating the strategy did a good job of cutting losing trades short. Moving forward, we would probably want to test additional stop loss strategies, as well as combinations of different stop loss strategies to see what results we get, and then incorporate the results into our trading system. At this point, you should have a complete trading system and thus be able to back test and forward test it to get an idea of the system’s expectancy Once you have this value, you can look to incorporate a position sizing algorithm to meet your trading objectives.